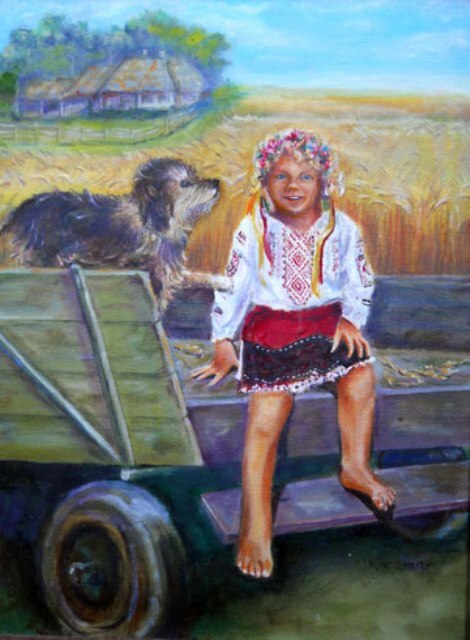 A day after my search started, Olga Kaczmar, a Ukrainian painter of Rusyn ancestry living in USA, replied to me. She is a graphic artist and an advertising manager. As she states in her bio, “in 2007 and 2008, her art was used to promote a film and book on a genocide in Ukraine in 1932. She founded an international organization and maintains a website to unite relatives and friends lost after World War II” (1). This piece, called Harvest, is inspired by her homeland. When I was growing up, helping out on the field during a harvest season was something we always looked forward to. We would get to dig in the dirt all day long and have lunch on the grass, under the trees… You can purchase a print of this painting at her online store.